The Low-Down: Is Apple's NewsPlus A Netflix For Magazines? Is Apple's NewsPlus A Netflix For Magazines? Well, sort of. The big difference is that you can't see movies too many other places as conveniently as you can by streaming or downloading, whereas you can buy magazines elsewhere (hard copies: what a concept!). And Apple's draconian terms may actually hurt magazines if it attracts too many current subscribers away from the publication. 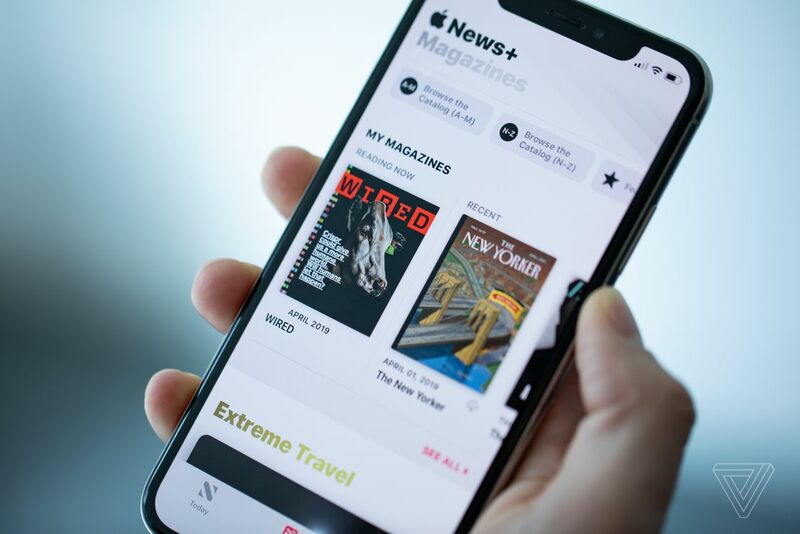 The question of whether to pay for Apple News Plus depends if you like reading magazines enough to fork over $120 a year for access to more than you’ll ever be able to reliably consume. For some, unfettered access to new issues of The New Yorker, Rolling Stone, Wired, and hundreds more could be well worth the cost. But there are a lot of caveats. (And) you’d be saving money and directly contributing to publications by directly subscribing, which grants you digital access to the websites and full issue downloads. There’s a lot to evaluate about Apple’s new News Plus subscription service, including if it’s a good deal for the media business and forecasting how much of an existential threat it poses to an already at-risk industry. But inherent to those debates is whether iOS users actually use the service and find enough value in it to pay for it in the long run. Does it provide a decent user experience, and is it worth the $10-a-month subscription fee, considering it doesn’t offer you a whole lot of actual hard news? If you’re thinking about subscribing, that — and only that — is what you should be focused on: getting a service designed mostly for magazines. For some customers, unfettered access to new issues of The New Yorker, Rolling Stone, Wired, and hundreds more could be well worth the cost, and I would have to agree. But there are a lot of caveats, and we’ll get to those. That the company delivered a strong magazine experience should come as no surprise, considering Apple based the entire product on the offering of Texture, a Netflix-for-magazines startup it acquired last year and retooled into the premium Apple News tier. Apple News Plus has many of the same deals in place that Texture originally secured, including ones with mammoth publishing brands like Condé Nast, Time Inc. owner Meredith Corporation, and Hearst. For those on the fence, the question of whether to pay for Apple News Plus depends, primarily, on if you like reading magazines enough to fork over $120 a year for access to more than you’ll ever be able to reliably consume. Going one step further, how you like to have your news delivered will also greatly impact how valuable this service is to you. Do you prefer standard Apple News’ mix of algorithmic and human curation, or would rather manually select individual stories as you browse a collection, which is arguably what News Plus is better at? 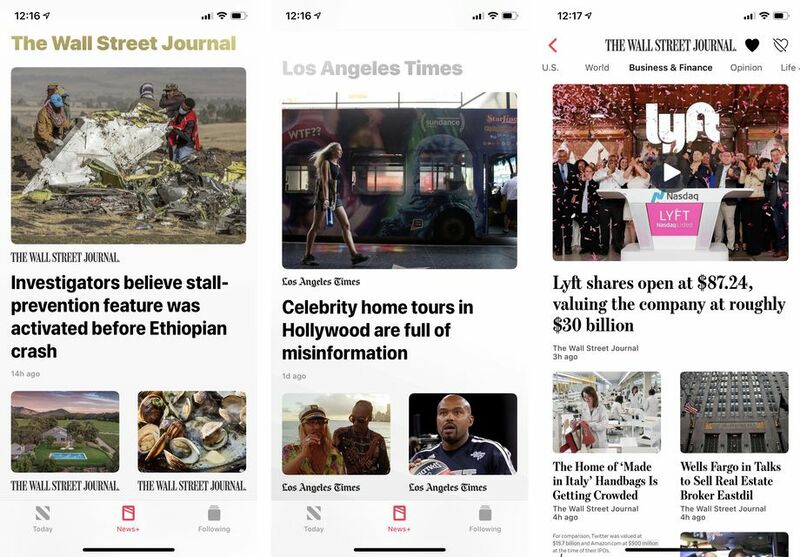 To make those determinations, it’s best to tackle Apple News Plus by evaluating its core pillars: its design, its news delivery mechanisms, and the overall value. With the update to iOS 12.2, Apple News Plus now sits in its own dedicated center tab on the mobile app. Opening it up makes clear what you’re getting and why you should be subscribing, with a large “Magazines” header up at the very top, followed by catalog browsing options and a carousel of the latest issues of the magazines you follow. It’s spartan and simple, and Apple makes it pretty easy to browse the entire catalog of 250-plus magazines and also jump into category-specific lists. But that’s roughly where the good design ends and the frustrations begin. There’s a moderate amount of recommendations and curation going on in the background as you scroll through the News Plus tab, but what you’re seeing and why feels so opaque and scattershot that it’s not really useful. While the service is great as an all-you-can-read buffet, Apple does very little to help readers maneuver the massive mountain of magazines they now have access to. You’re better off just tapping the like button on the five to 10 magazines you’re interested in reading every week or month and just perusing the new issues list. When it comes to the reading experience, the lack of standardization across publications makes it difficult to know what you’re getting into when you download an issue of a magazine you’re not familiar with. The density of the interface makes reading and maneuvering from an issue’s table of contents to an article page and to the publication hub a total pain. Regardless of whether a magazine is using ANF or PDF-style file formats, I find myself too often encountering badly translated articles that were never designed to be read on a phone screen, with plain, clunky page designs. The closest thing to a thoughtfully designed layout is the text-heavy magazines, like The New Yorker and The Atlantic, that simply rely on drop caps, the occasional photo, and a pull quote or two to spruce up the page. That these no-frills layouts are preferable speaks to how much work Apple still has to do on the design side, both with the tools it provides publishers and with the ways it organizes information on the main News Plus tab, to make this a product worthy of being part of the company’s new slate of premium services. As you start to scroll down, you’ll begin to notice the first of many annoying design quirks. Apple News Plus doesn’t let you follow magazines by clicking on them from the News Plus tab. Instead, you have to tab over to the “Follow” section, search for the magazine by name, and tap the heart icon. That way, it will show up in the carousel of recent issues. If you want to browse past issues of a magazine, you need to tap the logo at the top of the screen to be brought to that magazine’s homepage of sorts, where you’ll see a list of recent issues you can page through and download at the top. Tapping into a magazine gets you a rudimentary table of contents that’s specially designed for Apple News Plus. Despite that custom treatment, it varies wildly from publication to publication, and even in its best, most detailed format, you’re getting only section headers and the occasional byline underneath. Some versions, as is the case with most of the available Condé magazines, feature just a list of print headlines, devoid of context. That makes it impossible to know exactly what you’re tapping into and how long the story will be. (Esquire was one of the few magazines that seemed to include story descriptions in its TOC.) The closest thing to a time-to-read estimate is the scroll bar that indicates where you are in the article. 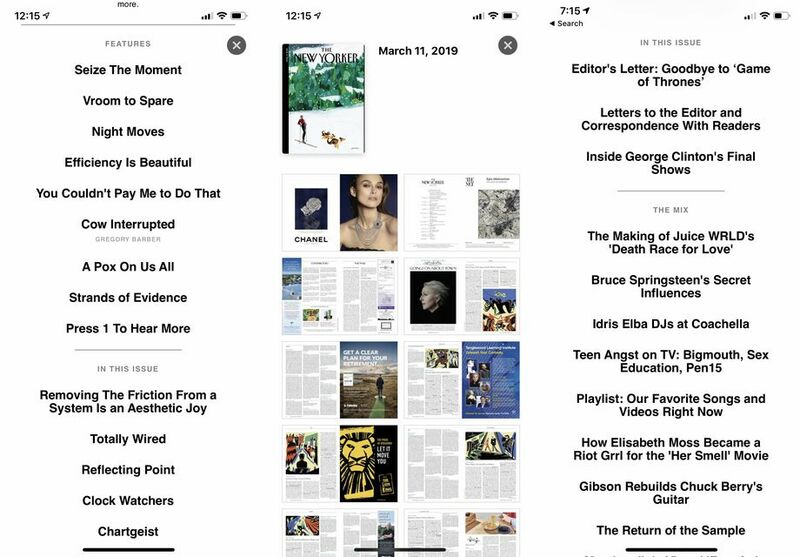 All in all, the TOC is perhaps the worst-designed element of Apple News Plus, and it needs a serious design overhaul I’m guessing from both the publisher and Apple. When it comes to actual page layout, magazines that rely on ANF appear to do a better job of translating print layouts to digital ones. But graphic-heavy publications and those that do more adventurous article designs are clearly torn between doing plain, simple layouts and getting more experimental with the unique perks of ANF. Those perks include GIF-style animations and containers for custom headers, pull quotes, and captions, but they’re often wildly inconsistent in how they’re applied. I often found articles in the same issue of some magazines to feature wildly different levels of complexity in their layouts. It’s not at all clear if this is an issue with Apple’s tools making it time-consuming or cumbersome to give each story a proper custom touch or just a lack of resources and investment on the publisher’s end. Another deficiency is that only the latest issues and new issues going forward get these special designs. If you tap a past issue of, say, Wired or Rolling Stone, you’re forced to read it either page by page or by jumping around a full PDF-style overview. Trying to read any one page requires manually zooming in because the text is so tiny. That’s clearly not an ideal way to read backlogs of digital magazines, and it’s a big sore spot for those looking to Apple News Plus as a way to work through recent archives. It’s also not clear how far back the backlog of any one publication runs without you scrolling through it yourself. Most popular publications appear to have uploaded issues only until somewhere between March and September of last year. For newspapers, the whole experience is markedly worse. The two biggest participating newspapers, The Wall Street Journal and the Los Angeles Times, are available apparently in full, but they’re only delivered as boxes of recommended stories you’ll find once you scroll about a third of the way down the News Plus tab under all of the magazine recommendations. It’s not clear how these stories were picked or whether you’re getting the most up-to-date news available; the selection tends to feature stories that are either many hours or sometimes even a full day old. To actually browse the full WSJ or LA Times offerings, you again need to tap into a story and then tap the logo at the top. Once you’re there, you’re getting the standard Apple News layout, which breaks up publications by respective sections like Home, US, World, Business, and Entertainment. Unfortunately, there’s no way of telling whether the stories you’re seeing are provided to you via your News Plus subscription or stories available to non-paying users. You just have to trust that you’re getting the full, premium experience, even when the timestamps on the stories might indicate that you’re not receiving the most up-to-date stream of articles. Granted, none of those design and delivery issues are enough to sink News Plus. They’re mostly strange inconsistencies that, while annoying, speak more to Apple’s scattershot partnership approach that seems to be yielding different levels of attention to detail, specificity, and investment from participating magazines and newspapers. Hopefully, over time, there’s more standardization and these design issues get ironed out. The biggest question you have to ask yourself is whether you’ll actually use Apple News Plus and if it’s worth as much to you as, say, a Netflix or Spotify subscription, which are two services from which most consumers can more readily pull value. For avid readers of specific magazines, you can get two or three of your favorite publications for far less than the $9.99 a month that Apple is charging for News Plus. The New Yorker costs $60 a year for nearly 50 weekly issues, while Wired’s new paywall and monthly magazine subscription combination cost half of that. You’d be saving money and directly contributing to both publications by directly subscribing, which grants you digital access to the websites and full issue downloads anyway. If you really want to read The Wall Street Journal, then yes, Apple News Plus is the cheapest and best deal out there right now to do that. But again, the design and delivery mechanisms inherent to the service in its current state make it very difficult to read the paper as you would a physical version or with full access to the website, which you don’t get with a News Plus subscription. It’s also incredibly dubious to think that the WSJ is getting anything financially beneficial from its deal with Apple, considering it’s getting only a fraction of a $10 subscription fee for a product it typically sells for $37 a month.